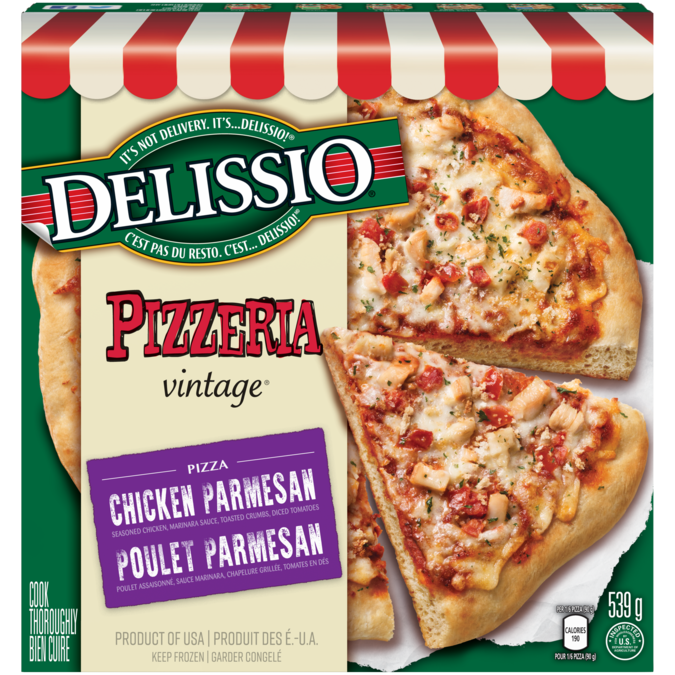 Your family’s favourite restaurant menu item just partnered up with Delissio Pizzeria Vintage! Try NEW Chicken Parmesan – our pizzeria style crust topped with marinated chicken, toasted crumbs, diced tomatoes and marinara sauce. 1) Preheat oven to 375°F (191°C). 2) Remove frozen pizza from all packaging. 3) Place frozen pizza directly on middle rack of preheated oven. Bake for 19-21 minutes or until cheese is melted and crust is golden brown. Let stand for 5 minutes before serving. Caution: pizza will be very hot. Handle with care. For best results do not bake on cookie sheet. For food safety and quality, product must be cooked thoroughly to a minimum internal temperature of 160°F (71°C). Your oven temperature may vary so adjust cooking time and temperature as necessary. Keep pizza frozen until ready to bake.